Do commercial buildings become less efficient when they provide grid ancillary services? Commercial buildings offer a vast thermal energy storage capability. Control of building heating, ventilation, and air conditioning (HVAC) systems can potentially be used to balance variations in renewable generation and load. Specifically, buildings can provide ancillary services to the grid by decreasing and increasing consumption with respect to their baseline, making them appear as energy storage to the power system operator. However, a recent study has shown that buildings providing these services tend to consume more energy, resulting in a low effective round-trip efficiency. To explore this phenomenon further, experiments were conducted on three buildings on the University of Michigan campus. The buildings were chosen to provide a variety in structure, size, and HVAC system layout. They were instrumented in early summer of 2017 and baseline power and building automation system (BAS) data were collected for several months in 2017 and 2018. The building thermostats were then perturbed through predefined patterns emulating ancillary service events, enabling detailed investigation of the resulting electrical energy consumption. 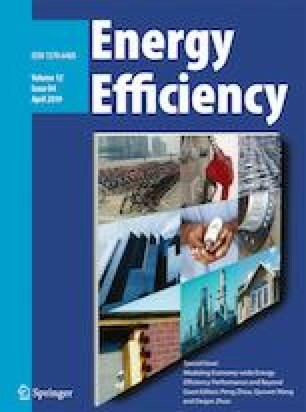 This paper presents experimental results, focusing on the additional energy consumed and effective input/output efficiency. The three buildings respond with mean round-trip efficiencies ranging from 34 to 81%, with individual tests yielding efficiencies far outside that range. We also find that the efficiency of building response depends on the magnitude and polarity of the temperature setpoint changes. Our results are consistent with past experimental results, but inconsistent with past modeling results. This indicates that the models need to be improved in order to capture the energy impacts of ancillary service provision by buildings. We are immensely grateful to Dr. Sina Afshari for setting up the experiments on campus. We also thank Paul Giessner for helping set up the code to process the building data, Scott Backhaus for insightful discussions, and Jonas Kersulis for his inputs on the paper. This work would not have been possible without the tremendous support of the staff at the University of Michigan’s Facilities and Operations Group and Energy Management Group. We would especially like to thank Kevin Morgan, Andrew Cieslinski, and Connor Flynn from the Energy Management group for their constant support and feedback. We also thank the building managers of Rackham, BBB, and Weill Hall for their cooperation with the research. This research was funded by the University of Michigan’s MCubed Program and a Rackham Summer Award. Raman, N.S. and P. Barooah. 2018. “On the round-trip efficiency of an HVAC-based virtual battery”. https://arxiv.org/abs/1803.02883. U.S Energy Information Administration 2016. “Use of energy in the United States explained.” https://www.eia.gov/energyexplained/.